Kronic Productions is pleased to announce the "2nd Annual Classic Rock Salute to Joe "The Godfather" Anthony" on OCTOBER 20, 2018 in San Antonio, Texas @Vibes Event Center. Set to appear and flying in direct from L.A. will be the long awaited return of LEGS DIAMOND!!! Performing hit after hit!!! Taking you back in time to La Semana days!! 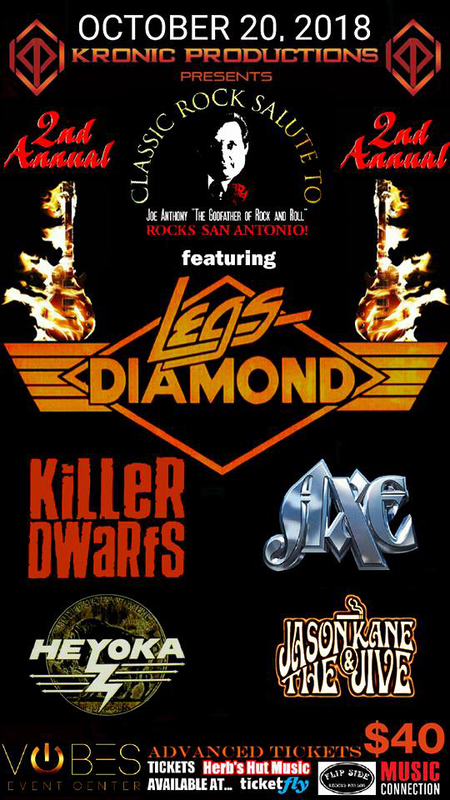 Direct from Toronto, Canada to "Keep the Spirit Alive" will be the KILLER DWARFS!!! AXE is set to bring their "Rock n Roll Party in the Streets" back to S.A.!! HEYOKA returns with their remarkable heritage classic rock performance!!! Special guest includes the true vintage classic sound of S.A.'s own... JASON KANE & THE JIVE! Tickets go on sale November 18th, 2017 @ticketfly (online), Flipside Record Parlor, Music Connection, Herb's Hut Music, The Rock Box, with more ticket outlets TBA.